Foyles expands its “Bookshop of the Future” concept beyond London with the opening of its new “physical meets digital” bookstore in Birmingham. 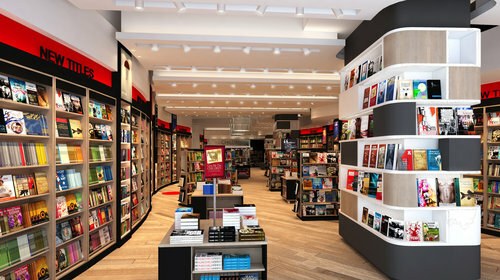 Foyles bookstore opened its newest “physical meets digital” bookstore in Grand Central, Birmingham last week. The 4,300 sq. ft. Foyles is nestled between John Lewis and the White Company in the upper concourse of the new retail development. The store includes 15,000 titles and a variety of digital interactions such as three audio-visual author pods and one children’s story pod, where best-selling writers read their work, digital signs including a floor-to-ceiling display, and booksellers with tablets that allows access to millions of books. The pods will include Simon Schama, Neil Oliver and a variety of Man Booker Prize shortlisted authors. The children’s pod will have Michael Rosen reading poetry. And a variety of live author talks will take place in-store such as the upcoming talk with Cressida Cowell, author of “How To Train Your Dragon” on October 17th. She will open up the children’s department, which is very important focus for Foyles. The Foyles store, designed by lustedgreen, keeps with the existing theme of size and style as The Foyles branches in Westfield Stratfod City, London Waterloo Station and Royal Festival Hall. With the opening of this branch, Foyles is up to six stores, four in London, one in Bristol and now Birmingham.